This morning's launch of NASA's Aura atmospheric chemistry satellite from Vandenberg AFB was cancelled just before lift-off because of a battery problem with the launch vehicle. The spacecraft is now scheduled to lift-off from Space Launch Complex 2 West aboard a Delta II rocket on July 15 during a launch window that extends from 03:02 to 03:05 PDT (10:02 to 10:05 UTC). After lift-off, the rocket will rise vertically for several seconds before it begins to head south. If the Delta functions normally, Aura will be inserted into a 438-mile-high (705 km) circular orbit inclined 98° to the equator. Once Aura becomes operational, it will observe the portion of the atmosphere between the Earth's surface and a height of 50 miles (80 km). The craft's advanced instruments will measure atmospheric temperature and the concentration of selected gases and aerosols. Information from the spacecraft could answer a variety of questions including if the ozone layer is recovering, which processes control air quality, and how the Earth's climate is changing. Since the launch occurs before dawn, it could be visible for hundreds of miles - perhaps as far away as portions of Nevada, Arizona, and Mexico. Just before liftoff, the Delta's first stage main engine and several strap-on solid fuel rocket motors will ignite. Observers may see a flash on the horizon from the direction of the pad, a few seconds of darkness, and then a rising orange orb or "star". The brightness and color of the Delta at this point will be due to the solid fuel motors' brilliant orange flames. Two events to look for during the first stage burn are the jettison of the solid rocket motors. The spent motors will still be burning and will flash as they tumble during free-fall. Six rocket motors will be jettisoned about 1 minute 27 seconds after launch followed by three more at about T+ 2 minutes 12 seconds. These events should be visible to the naked eye for a distance of at least 100 miles (161 km). After solid motor jettison, the liquid-fueled first stage main engine will continue to power the Delta II. Since liquid fuel engines produce a dimmer flame than solid fuel motors, the Delta will drop in brightness. 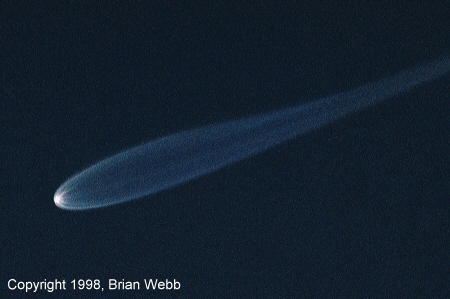 Observers in dark locations may see the Delta's first stage exhaust plume take on an elongated or jellyfish-like appearance as it expands at high altitude. At about T+ 4 minutes 24 seconds the first stage main engine will cut-off and the vehicle will disappear into the darkness as it heads downrange. This image shows what the Delta exhaust plume may look like in binoculars during the end of the first stage main engine burn. Note the elongated or jellyfish-like shape mentioned above. Photo taken during the 1998 November 6 morning twilight launch of a Delta II rocket and five Iridium satellites from Vandenberg AFB. Although the naked eye is a good instrument for viewing the launch, optical assistance will provide a better view. Binocular are good, but tripod-mounted binoculars are even better. An astronomical telescope will give the best view and may provide a dynamic, surreal light show. "At its maximum development, the first stage engine's plume took up 8/10 of the telescope's field of view. I could see an orange speck (the first stage engine) spraying curved lines - both thick and thin - of light that formed a hemispherical plume. Near the engine, the lines were blue-green in color. Further away the lines were fainter and white in color. What was really interesting was the motion visible in the plume. Within each line of the plume, there were numerous areas that were brighter than others. I could see these bright areas exit the engine and rapidly travel down the lines and disappear. It was very much like looking at the water droplets spraying from a sprinkler." The visibility of the launch will depend almost entirely on the weather. During the warmer months of the year, the weather in central and southern California is fairly predictable. At launch time, the coast and areas several miles inland are usually plagued by low clouds extending up to about 1,500 to 2,000 feet (457 to 610 M). The probability of coastal cloud cover varies from about 60 to 70% depending on the location with Vandenberg AFB falling in the middle of this range. However, the interior tends to be clear. This satellite image shows the coastal low clouds usually present in central and southern California during the pre-dawn hours in July. To view the launch, find a location that is as high as possible and far from city lights. For the best view, find a spot in the coastal mountains or hills parallel to the rocket's flight path and high enough to be above any coastal low clouds.